Recently, Google has added more advertising restrictions labelled as “Abusive Experiences.” These are in addition to the previous restrictions that were implemented in Chrome version 64 back in January 2018. With the release of Chrome version 71 (4 December 2018) all restricted ads will be blocked by Google. If publisher websites display any of the ad creatives/ad formats considered as “Abusive”, Google will penalise these websites. More and more publishers are blocking ads that do not comply with Google. If you as an advertiser use false and misleading marketing methods, the volume of traffic you can gain will be drastically reduced which will inevitably lead to a lower revenue stream for your offers. A full list of Google restrictions including those from the Chrome 71 update. ExoClick’s labelling system for misleading ads explained with examples. Tips and advice on your ad creatives. Fake Messages: Ads or other elements that resemble chat apps, warnings, system dialogs, or other notifications that lead to an ad or landing page when clicked. Unexpected Click Areas: Transparent backgrounds, non-visible page elements, or other typically non-clickable areas that lead to an ad or landing page when clicked. Misleading Site Behavior: Page features such as scroll bars, play buttons, “next” arrows, close buttons, or navigation links that lead to an ad or landing page when clicked. Phishing: Ads or page elements that attempt to steal personal information or trick your users into sharing personal information. Auto Redirect: Ads or page elements that auto-redirect the page without user action. Mouse Pointer: Ads or page elements that resemble a moving or clicking mouse pointer that attempt to trick a user into interacting with it. Malware or Unwanted Software: Ads or page elements that promote, host, or link to malware or unwanted software that may be installed on a users’ machine. Ads with Missing or Misleading Branding: Ads that promote or depict unidentified or fictitious businesses. Examples include ads or other elements that are missing a company name, branding, and a logo — even if a generic description is included. This rule was added, then later removed by Google, however, this rule could still be enforced in the future. 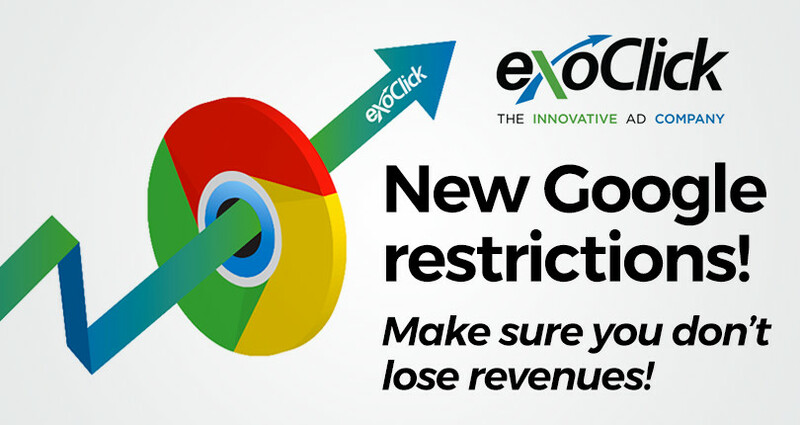 ExoClick offers this blocking option in our labelling system to publishers which is a separate blocking option and not included in our grouped Google compliance labelling. on the advertisment’s landing page. Showing any of the above marketing will impact publishers negatively, therefore ExoClick has introduced a simple labelling system. The labelling system is designed to allow our publishers to select what type of advertising and associated campaign actions they want on their websites, and to filter out campaigns they do not wish to appear on their sites. Our labels are applied to Banner and Landing Page marketing material that contain misleading elements which go against Google’s restrictions. What does this mean to you as an advertiser? Whenever you submit a campaign, our Compliance Team will add labels based on the submitted banner(s) and what is displayed on the landing page(s) via the URL links. Misleading elements will drastically reduce the number of impressions/clicks you will receive as premium publishers cannot accept these on their sites. Here we have illustrated acceptable and non acceptable ad creatives using banners as examples, but these should also apply to popunder creatives. Misleading Branding: Banners or Landing Pages that promote or depict fictitious businesses. An example would be the reference of well known brand names such as Facebook, Whatsapp, Snapchat, Tinder, etc used in marketing material as well as imitating the design, colour schemes, logos and elements of these well known brands. This is not only misleading but could be considered copyright and trademark infringement. Missing Branding: Banner or Landing Pages that depict unidentified businesses. Any banner or landing page that does not clearly factually state the product name or brand name will have this label applied. This includes ads or other elements that are missing a company name, branding and/or a logo. Misleading Mouse Pointer/Tap/Swipe Icons: Banner or Landing Page elements that resemble a moving or clicking mouse pointer, a tap or a swipe icon that attempts to trick the user into interaction with the ad. Misleading Call To Action: Banner or Landing Page elements that depict a call to action that misleads a user into clicking the option and the action does not happen. For example, buttons that say “WATCH VIDEO” or “GO TO VIDEO” that when clicked by a user they do not lead the user to the video depicted in the ad. Misleading Antivirus Alerts: Banner or Landing Page elements that resemble misleading statements, alert icons, alert colours that attempt to trick the user into believing that they have an issue that needs fixing on their device which is not true. Misleading Browser/System Alerts: Banner or Landing Page elements that resemble system dialogs, imitations of Windows, IOS, Android system alert notifications and other related elements. Misleading Chat Request: Banner or Landing Page elements that resemble chat applications that mislead the user into believing that they are really being asked to chat to an individual, when this request is fake. Misleading Close/Cancel buttons: Banner or Landing Page elements that mislead users in to clicking on options to close an ad when in fact the ad does not close at all. This includes buttons that say close, no, cancel or fake close X. Misleading Download/Play buttons: Banner or Landing Page elements that mislead users into clicking on Play or Download buttons that do not perform the operation that they are intended to perform. Misleading Video Players: Similar to the misleading Download/Play buttons regulation. Banner or Landing Page elements that depict or imitate a video player including play icons, timers, scrollbars but then mislead the user. For example clicking to play a video when there is no actual video to play. Misleading Site Pagination: Banner or Landing Page elements that mislead users into clicking buttons that are fake and do not do as stated. This includes imitating page numbers typically found on Tubesites, navigation options, skip buttons, arrows that mislead a user into clicking on the ad. 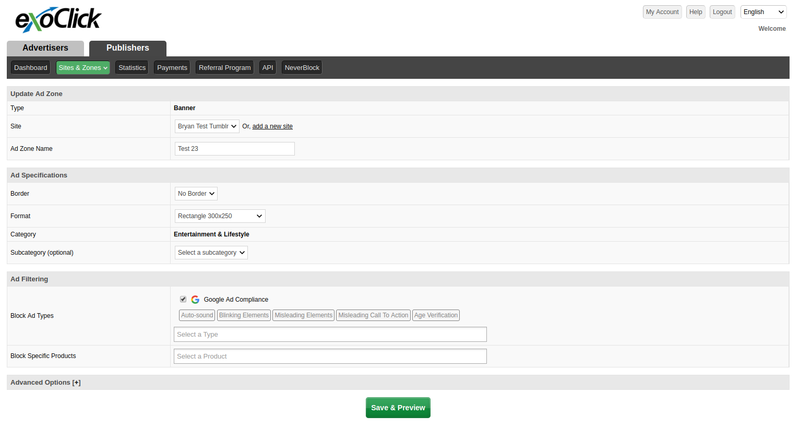 Native Advertising Branding: Advertisers are required to enter the name of the brand or product in the “brand” field in ExoClick’s admin panel when creating a native advertising campaign. The brand does not have to appear on the promotional image, but it must match the brand or product name on the landing page that the native ad’s url leads to. To avoid losing traffic for your campaigns, we highly recommend that you immediately consider sourcing new marketing material without any misleading elements and comply with Google’s new restrictions. Online advertising is a highly competitive market, these restrictions allow you to find new creative solutions to stand out from the crowd. These restrictions are designed to not mislead consumers, therefore it gives you the opportunity to comply and build up consumer confidence and trust in your brand. Brand all your marketing material, this provides you with the opportunity to really build up brand awareness with end users. If you are using affiliate offers along with their provided marketing materials, ensure to select marketing materials that are not misleading. Please do not hesitate to contact our Compliance Team or your account manager to learn more about these changes.